The Backside Heelflip - is a backside 180 ollie with a heelflip. Ollie, backside 180 ollie, kickflip, heelflip, backside flip. Backside heelflips are harder than they look. Get good at backside 180's, heelflips and backside flips. Learn the backside flip first. they are just easier to get . Once you know the technique it will be straight forward to land a back heel. The skateboard will really fly away from you with this at first. To stay over top of the board. Try leaning backwards into the trick a little more, pop straight up and higher. This will help keep it under your body through the trick. Flick your foot off the board towards the nose. That will help it stay under you. If you kick off to the toeside the board might flip but it often moves away from you too. Just like backside flips when you land you might not get the full 180° rotation with the board and your body. Just slide out the wheels the rest of the way. Getting better you will be able to land on the front trucks and pivot out the rest of the way. As you practice this trick it will get easier and easier to pull around. That is when you will develop your style of doing it. A Fakie backside heelflip or halfcab heel will be easier to flip and control. In fact it might be better to try this version first. Halfcab heels look awesome. They are a really good trick to have under your belt. Try and base your rotation around the back truck(while riding fakie this would be the leading truck). 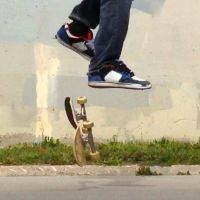 That way you can begin the 180 rotation while you are popping the trick.